This impeccably appointed penthouse is a model of luxury and elegance. With dramatic vaulted ceilings, natural light illuminates the entire home, creating a comfortable, chic vibe. This exceptional Woodland West home, with 5 bedrooms and 3 bathrooms, has been exquisitely remodeled and features an amazing pool and spa plus large grassy backyard, sited toward the end of a cul-de-sac street. Unique 3 bedroom + loft, upper level condo, in a Great Tarzana Gated Community, features an open floor plan, high ceilings and a sliding glass door that leads to a good sized balcony with a storage closet. The Master suite has an en-suite bathroom; seller has installed a washer/dryer. A single family home that contains 1,370 sq ft and was built in 1937. It contains 2 bedrooms and 1.75 bathrooms. This home last sold for $1,625,555 in April 2018. Exquisite Tarzana single story home located South of the Boulevard Situated in coveted and best Tarzana neighborhood. Located far from the street for ultimate privacy. Completely gated and electric front gate with controlled access entry. This newly built Hampton's Farmhouse designed by premier luxury builders blends an elegant rustic vibe w/ Smart Home Technology. Sited on a street lined w/ majestic Sycamore Trees at the gateway to Royal Oaks. This home has 6 bedrooms (2 on lower level) plus a Guest House sitting on 1/3 acre lot w/ resort grounds. This recently rebuilt home, in 2001, awaits on tree-lined Valley Street in the desirable Toluca Woods area. 4 bedrooms, 2.5 bathrooms with features we all want for our family. 2,112 sqft of living space. A large open kitchen with center island immediately serves the dining room warmed by the fireplace. adorable Bungalow providing your own oasis in Highland Park! Hillside living on a quiet street provides privacy, fresh air & plenty of room to entertain! A bonus sun room, not part of the square footage, provides an indoor/outdoor area to relax. Hang out on the deck or walk up the lighted stairs in the backyard to a tree lined area where there sits a bench and foundation/hook-ups for a Hot Tub. Welcome to this stunning condominium located at the heart of Hollywood hills- just steps away from Hollywood hot spots with full lush trees with 2 pools, tennis& paddle court, renovated gym, saunas, Jacuzzi great rec room, and dog park. This fully renovated & updated throughout unit features 2 bed and 2 bath. Condo home that contains 2,760 sq ft and was built in 2008. It contains 4 bedrooms and 4 bathrooms. This home last sold for $875,000 in June 2017. Located at the end of a charming cul-de-sac, this lovingly maintained 2 story Traditional Pool home purchased new by the original owner contains 5 Bedrooms (1 downstairs,) 3 full Bathrooms + a Powder Room. A formal Entry leads to a light & bright step down Living Room & a large Den with Fireplace. Excellent investor opportunity or move right in...condo under $200k in the west valley..This condo feels very spacious! One Bedroom and One Bathroom that's close to Warner Center. Brand new air conditioner and heater, freshly painted, all new window coverings, smooth ceilings and new carpeting through out! Absolutely stunning & perfectly remodeled single level residence! Featuring a spacious and open sunlit design, accentuated with luxurious wood floors and contemporary details throughout. Highlighted with new chef's kitchen, including stainless appliances, quartz counters, expansive dining area. Beautifully updated top floor condo in secluded back section of park-like Tarzana Woods complex. Skip the fixers and the flips - this unit has been lovingly maintained with pride of ownership including an updated kitchen with stainless steel appliances, refinished hardwood floors throughou. Updated 4 bedroom, 2.5 bath Encino Park home with drought resistant landscaping. Freshly painted interior, high ceilings, and recessed lighting mostly throughout the home. The expansive family room opens to the remodeled kitchen, offering granite counter tops, stainless steel appliances, and newer cabinets. Charming gated home in heart of the Encino South of the Blvd, Few minutes away from all the shops and restaurants. This gated, custom Spanish home located on a beautiful tree lined street in prime Toluca Lake will define true attention to detail. This elegant home features a large open living room with high beamed ceilings, fireplace, and spiral staircase. The high end chef's kitchen offers a large island and Sub Zero/Wolf appliances. Beautfiul and remodeled Tampa Estates home on a very quite tree lined street. Open floor plan with wood floors throughout, plantation shutters and goregous chefs kitchen. Large covered patio with stamped concrete, above ground spa, grass area for playing, long driveway and detached garage. The property is beautifully landscaped with fruit trees, privacy shrubs, and some water resistent plants. Beautifully appointed 2 bedroom, 2 bath, one story open floor condo, high ceilings, and gas fireplace. Encino 1 bedroom, 1 bath condo located on the top floor. Updated bath with tile floors & newer shower. Bright large living room with access to balcony. Large bedroom with great closet space. Great layout and plenty of storage with a multiple closets. Located in prime Encino, close distance to great restaurants and shops! A rare one of a kind offering in Fryman Canyon Esatates! Private architectural retreat up a long gated drive, on over 2 acres in a lush park like setting. Feels like you're living in 'Big Sur' year round while centrally located to Studio City, The Sunset Strip, Restaurants, Shopping & The Studios. This Gorgeous Gated Tarzana Pool Estate is located in a PRIME "South of the Blvd" Neighborhood with fabulous curb appeal, has just undergone an Extensive Designer Remodel. Nice 3 units property with Downtown & Canyon views located in desired Montecito Heights neighborhood. The property is minutes away from shops and freeway. The best of both worlds, looking for silence and wonderful exterior view from your window and patio.Plantation white shutters over all windows and 8 ft sliding door. Contemporary Family Home located South of the Blvd on a Cul-De-Sac! Single story floor plan offers 5 beds & 4 ½ baths, guest quarters, individual laundry room & 4,310 sq. ft. living space on a sprawling lot. Brand New Construction in highly desirable area of Sherman Oaks built in 2015. This fabulous home features brand new construction from the ground-up. Large and spacious 3 bedrooms, 2 bath home with over 1910 feet of living space on a large lot with pool. Large living spaces with high vaulted open beam ceilings & walls of glass are standard as well as the back to back dual fireplaces which separate the formal from informal rooms. Amazing gated 5 bedroom, 5 bath Cape Cod estate, located in the Hesby Oaks school district. Grand entry opens to the light-filled great room featuring dramatic high vaulted ceilings, sky lights, floor to ceiling stone fireplace, and wood flooring. Truly a luxurious environment made for entertaining and open living. Remodeled traditional w/ great natural lighting, expansive living spaces on a cul-de-sac street in a great part of Woodland Hills. Eye catching architecture at this 6 br,4 bth dwelling near top rated schools. Gated and remodeled 3 bedroom, 2.5 bath pool home located on a corner lot, full of curb appeal. This light and bright home offers an open floor plan with laminate wood floors, vaulted ceilings, and recessed lighting. Large living room with custom fireplace. Darling spacious light and bright! Great curb appeal! 3 bedrooms, (2 plus 1 large loft style bedroom) and 3 baths. Beautifully remodeled, freshly painted, brand new laminate flooring and brand new carpets. This great PUD home is located in a pristine, peaceful closed gate community. Great unit in a beautiful resort like complex. This 2 bedroom, 2 bath unit features wood floors, granite counter tops in the kitchen and large bedrooms with great closet space. Also includes a huge patio facing the hillside. Highly upgraded pool home, new granite counters in kitchen and bathrooms, double convection oven, and vaulted ceilings. Lovely, Well-maintaned, 2 Bedroom 2.5 bath, 1251 square foot, Townhome, in the highly sought after, park-like, Hidden Canyon Community of Westlake Village! This home is peaceful, private and in an excellent location in the community. Stunning Sun-drenched Architectural Townhome in the heart of Santa Monica. The 3 bedroom 2.5 bath feels like a single family home with Living Room and Dining Room opening to exceptionally large private backyard. Gorgeous architectural townhouse in the highly desired "Del Rey Arts District". This 2 bedroom, 2.5 bath with 1,530 sq ft features a beautiful main level with wood floors and high ceilings throughout, an abundance of natural light, and high end fixtures. Beautiful townhome located in estabished Tarzana Courts gated community. The townhome offers 2 bedrooms and 2 1/2 bathrooms with 1465 square foot of living space. Beautiful Move in ready single story West Hills home in a great neighborhood. Kitchen with granite counter tops/ center Island, Formal dining room with fire place, Formal living room, recessed lighting, light and bright, large grassy yard with lots of fruit trees. Bright, spacious 2 bedroom condominium in a highly desirable building. Choice location, just 1 block from the center of the Montana Ave shopping district. Perfect two bedroom condo in a prime location of Sherman Oaks. This move-in ready unit has an updated open kitchen which is perfect for the "Top Chef" in all of us. This charming home is located on a quiet street in a great location of West Hills. Townhouse that contains 1,121 sq ft and was built in 1976. It contains 2 bedrooms and 2 bathrooms. 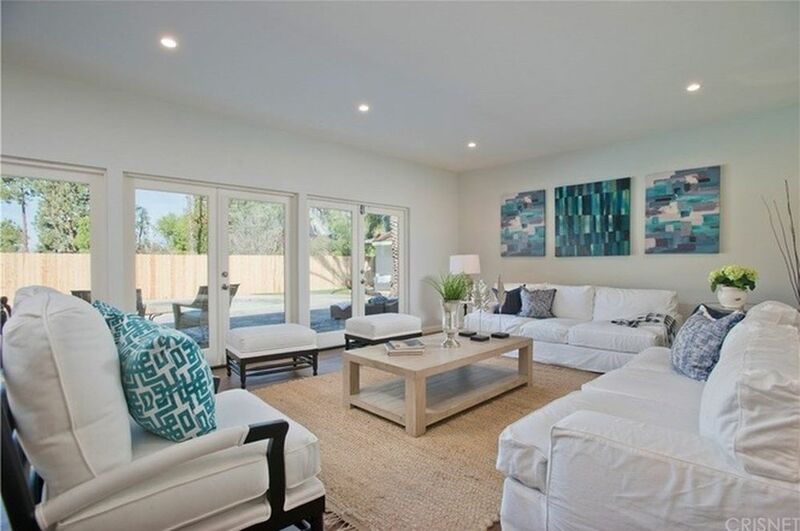 Completely Remodeled, Prime Encino Park Custom Home. Huge family room with 10' ceilings and large bay windows. 14' Entry Tower, Beveled Glass Oak door. A single family home that contains 1,377 sq ft and was built in 1955. It contains 3 bedrooms and 2 bathrooms. This home is completely redone. Newer paint, floors, windows. The kitchen and bathrooms are newly remodeled. Great open floor plan. Newer central A/C. Professionally landscaped with newer sprinkler system. Upgrades galore and move-in ready single level contemporary home. Great location within walking distance of schools, shopping & lots more! Situated nicely back from the quiet street. Inspiring Architectural Estate- Landscaping by the celebrated Jay Griffith. Peaceful gallery entrance ushers visitors to an explosive living room with 17.5 ft. ceilings. Ultimate use of space an open floor plan design that exudes peace & serenity. Private courtyard, swimmers pool & spa! Balconies & terraces create the ultimate indoor -outdoor California experience! Private & gated!